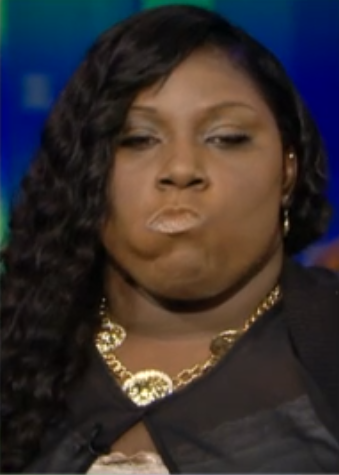 Last night Rachel Jeantel was interviewed by Piers Morgan. 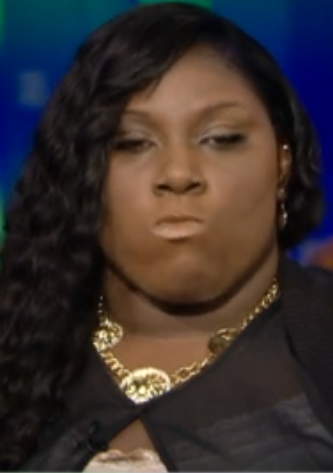 In the video excerpt above, Ms. Jeantel is shown listening to an earlier interview by Anderson Cooper of one of the six jurors in the George Zimmerman trial, say "I think she felt inadequate toward everyone because of her education and her communication skills, skills ... um, I just felt sadness for her." During the 0:06 - 0:07 segment, Ms. Jeantel can be seen displaying a very prominent example of a "Tongue-in-Cheek" nonverbal. A few moments later when Piers asks her, "What do you feel, about what that the juror said about you?" she answers, "Angry ... Upset ... "
A Tongue-in-Cheek facial expression must always be interpreted in the context of the other nonverbals present. Here Ms. Jeantel clarifies her emotion as anger, however although these emotions don't apply here the tongue-in-cheek can also be part of a cluster-context indicating sadness, smugness, deception, "I gotcha"/"I just won"/"You were caught", sexuality display and an alpha dominance display. In the fraction of a second preceding it, still at 0:06, what is very evident is her mid-face tightening, her lips foreshorten and her upper lip becomes thinner (compressed) and her jaw juts forward very briefly (in a microexpression). All of these body language signals indicate the emotion of anger (the initial stages of a tongue-in-cheek can also be seen here on her right). Tongue-in-cheek displays which are dominant/alpha (e.g. anger, smugness, sexual displays) tend strongly to be on the opposite side of those beta tongue-in-cheek expressions (e.g. sadness, lying). It is important to note that these right-left idiosyncrasies vary from person to person and have no correlation with hand dominance.